When A Feast for All Seasons was first published in 1997, the food world was at a very different place. Since that time, we’ve discovered slow food and the 100 mile diet and the green movement has grown legs and learned how to run. As a result, there has never been a better time to publish a book that focuses on the cuisine of the aboriginal people of North America. Especially since it’s a type and style of eating that has often been overlooked. This new edition of A Feast for All Seasons is published by Arsenal Pulp Press and it makes an interesting addition to a line up of cookbooks that are often eyebrow-raising, but always interesting. 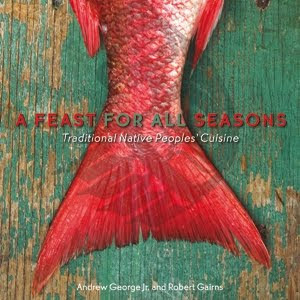 Since A Feast for All Seasons mostly focuses on native cuisines from the peoples from the west coast of North America, readers will be unsurprised to find a very good selection of recipes for sea creatures. Lots of traditional treatments for salmon and clams, but also preparations of herring roe, sturgeon, trout and the oily little eulachons that feature so prominently in many of the diets of the native peoples of the west coast.